I love writing. It cleanses my soul, helps me sort through my thoughts and ideas and gives me a way to connect with other like-minded individuals. I can’t imagine my life without writing and yet, there are days when I have to bribe myself to sit down and just do it. There are moments when words come to me like magic and flow from my fingers through the keyboard and onto the screen. But, most of the time, writing is a struggle and I have to actively get my mind and body in the right place. Every writer has different ways of putting themselves in the mood for writing and invigorating the creative synapses. Besides promising myself fancy coffee drinks, here is what helps me do what I love. A big ol’ rush of endorphins makes me feel as if I could write for five hours straight. I’m no good at meditation, so running is the closest thing for me. When I go for a run, my brain focuses on each step and becomes clear. Letting go of all the stressful clutter of the day lets inspiration shine forth. Suddenly, article ideas start to flood my brain. By the time I’m finished with the workout, I’m raring to go. A side benefit of staying active is that I get sick less, which means I have more time to write and spend less time wrapped up in a blanket on the couch watching reality television. I’m a traveler and have been living abroad for the past five years. You’d think I’d have something to write about every day, but the new becomes mundane and sometimes I am unable to see the uniqueness in where I’m living or the people around me. This is why I’m always on the search for new and exciting things to do in my vicinity. It could be a new coffee shop, a trampoline fun center I saw on the news, or a hike in the mountains. Here in Thailand, I jump on my scooter and attempt to find new beaches or restaurants I haven’t been to before. There is so much to explore, even just twenty minutes from home. Whether I do these things alone or with friends, it helps to jumpstart my inquisitiveness and reminds me that there’s always something to write about, no matter where I am. If I stay in the same routine and do the same things every day, then writer’s block will surely descend on me. I don’t believe you can be a writer unless you are a reader. I don’t believe you can be a writer unless you are a reader. Reading shapes our minds, gives us empathy, insights into other cultures, and ways of writing that may not have occurred to us before. When I read writers like Jack Kerouac, David Sedaris, Dave Eggers, Bill Bryson, Cheryl Strayed, Chimamanda Ngozi Adichie, and Rita Golden Gelman, I’m unable to fathom how they can write so beautifully and poignantly. Reading their work inspires me to keep going, to keep writing, and to try to put as much honesty into my work as I can. Reading travel writing from women around the world (such as here on Pink Pangea!) also makes me feel like I’m a part of something bigger; a community of lovers of the written word. Just like me, they may sometimes struggle to get the words down, but they never give up. 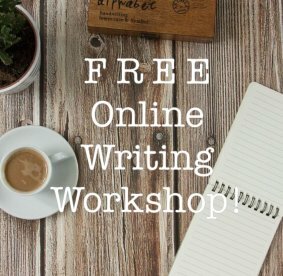 Sign up for a FREE writing workshop here. At 28 years old, I’m hardly old enough to say “back in the day,” but when I began traveling, smart phones weren’t everywhere and so I spent most of my time on buses and trains writing in my journal. This got me into the habit of always carrying a pen and paper on my travels, which has been essential to good writing. Without my journal, I would never remember the names of places, the conversations I had, or the exact feelings I went through. Writing also gets the creative juices going in a way that a laptop never can. I read a great book like Eat, Pray, Love and think my god, my life is far too boring to be written about. I’m not having life-changing experiences in India or meeting the love of my life in Bali. What can I even write about? But then I try to look at my life from an outsider’s perspective and I realize that the everyday things in my life make great writing material. My job as a kindergarten teacher in a private Thai school is humorous, the conversations I have with monks and taxi drivers are full of insights into another world, and the foods I have become so accustomed to are intriguing to people who have never tried them. My everyday life is full of words waiting to be written, when I pay attention. What works for me may not work for someone else. Hunter S. Thompson’s crazy routines of booze and uppers helped him to write, and as much as I adore his writing, if I followed his lifestyle, I’d be dead. So, find habits that make you happy and get that magic flowing from your fingers. And no matter what, keep writing.